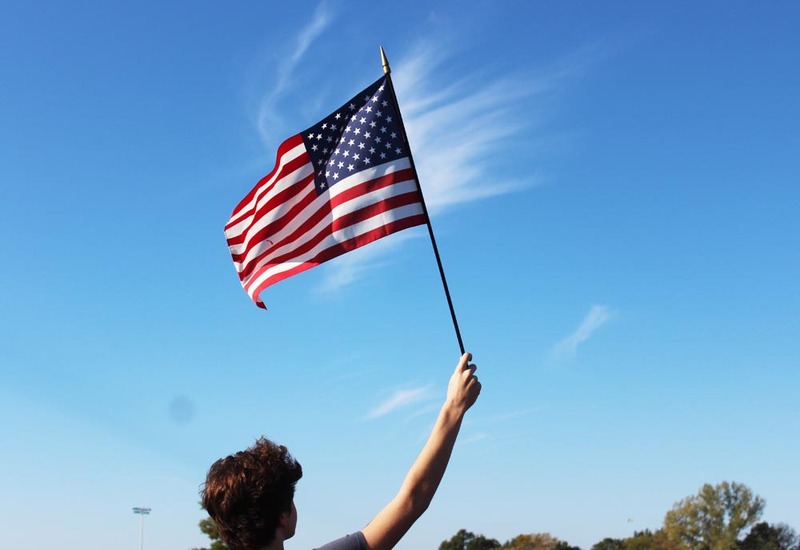 Freshman Ben Yelton proudly waves an American flag outside of RBHS. The stars and stripes represents, among other things, inalienable rights detailed in the Constitution. The Walter Cronkite New Voices Act would expand these rights for students journalists. As American citizens, we are able to speak, write and believe in what we want. The First Amendment spearheads the iconic Constitution, but some of the powerful rights stated in the document are not always guaranteed. One of these exceptions hits particularly close to home. In 1988, the Supreme Court decided in Hazelwood v. Kuhlmeier that a Missouri high school student’s First Amendment rights were not being violated when the school’s principal prohibited the student’s article to be published. Essentially, the decision allowed for schools to censor the work of their students. The Hazelwood v. Kuhlmeier decision set a powerful precedent throughout the country, and particularly in Missouri. Mo. House Representative, Rep. Elijah Haahr, however, seeks to overturn this precedent through a new bill. The state congressman is sponsoring House Bill 2058, generically known as the Walter Cronkite New Voices Act, which would prohibit school censorship of the bill. Frank Lomonte, Executive Director of the renowned Student Press Law Center (SPLC), is assisting Haahr in his attempt to pass the bill, and described the impacts, particularly the more freedom granted to student journalists, that the bill would have on students. The new bill, if signed into law, would overrule the precedent set by the High Court’s decision nearly 30 years ago. Overby, however, said the Court was correct in its decision. On the other hand, Lomonte said Court was incorrect in its decision, as it bestowed a large amount of power to the school. While Lomonte disagrees with the Hazelwood ruling, he feels encouraged by the new opportunities and precedents that would be created by HB 2508. Ultimately, Lomonte stated, the purpose of the Walter Cronkite New Voices Act is to provide students a sense of confidence and comfortability, and allow them to successfully complete their duty as student journalists. Ji-Ho Lee is a senior, co-editor-in-chief, production manager and editorials editor for The Rock and Bearing News. His two favorite people in the world are Jesus Christ and Ronald Reagan. He enjoys fishing and spending time with friends and family. He plays baseball for Rock Bridge and is a leader of the student section. He has a great taste in music and is a passionate fan of the Chicago Cubs, Bulls and Blackhawks.